I have done the odd post on women who “nail it” in terms of personal style – Mrs Simpson and Frida Khalo – so here is another (living) one. I love Linda Fargo. 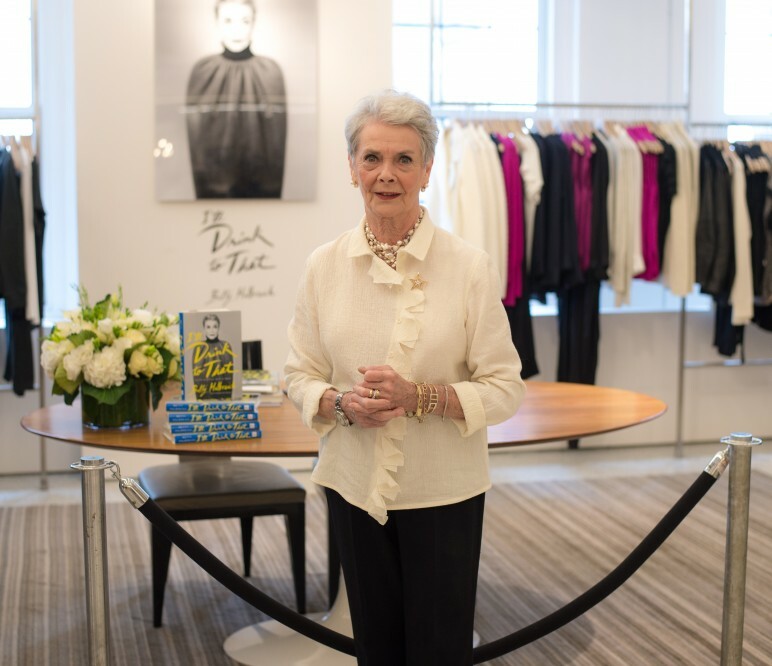 She is Senior VP and top buyer for Bergdorf Goodman in New York. She is a stylish, older woman, who smiles broadly, wears dramatic fashionable clothes, but always with a good awareness of what looks great on her. In these photographs, she wears barely any make up, so we can see her amazing naturally grey hair, her deep blue eyes and her clear, fresh complexion. A classic, simple to care for hair cut and a great smile. She is not a model – she has a normal figure, rather big teeth and she doesn’t appear to rely on surgical interventions to keep he fresh look. She just chooses great clothes to complement her dramatic wardrobe personality and to show case what her store is offering. Her a denim shirt and starry necklace work perfectly with her colouring and style. The beige Aran linen sweater with the white fur coat is also a simple but very effective pairing. When it comes to dressing up for evening events or the camera she can also turn it on. She backcombs her hair, wears Ladybug by Mac lipstick and puts some eye liner on. Aren’t these colours fabulous on Linda? I love the combination of red trousers, a bright blue silk blouse and an animal print belt. The relatively simple lines of her clothes mean she always looks elegant and stylish even though these are colours that not everyone could get away with. Linda is individualistic but always classy. She knows what suits her, and although she clearly has the pick of the wares of fashion designers of the world she often chooses clothes that would be fairly easy to copy or make, at a much lower price point. Clearly those in the fashion industry have a heavy burden, in that they are expected to look great all the time and showcase the work of designers. How we would shriek if we were ever exposed to Anna Wintour’s eyes or wrinkles. But I sense that Linda is authentic and not afraid to be herself. She laughs easily and gives the impression of being open and friendly with everyone. Bergdorf’s employ personal shoppers to help the rich and famous look their best. These guys earn unbelievable amounts of money according to the fascinating documentary Scatter my ashes at Bergdorfs.The most famous of these is Betty Halbreich who wrote a book about it, I’ll drink to that. I would quite like to be her. On second thoughts I think I would rather be Linda. I agree, great style and hair. Lovely, Kate. I especially love this part of the quote from her: “and the vision to believe that beauty can be found anywhere.” I agree wholeheartedly. I am always surprised by how quick people are to overlook the beauty that already exists (in them, in others)! I like red pants, too. Hmm…I think I might wear some today. Sometimes I have a ‘wobble’ of confidence over colour. But I know it looks good on me with my dark colouring, sometimes I’m conscious of standing out and bringing attention to myself. Then I see posts like this and I know colour looks great and I should just go for it. Also over at ‘did you make that’ today Karen is looking fab in bright orange top and blue trousers. They both look lovely–and that blouse of Betty’s is simply elegant. It might be fun to copy it.